Only recently I have bought a jar of black-eyed peas. Spanish food days lasted for a whole week and we enjoyed the Mediterranean flavours so seducing, beautiful and passionate just like flamenco dance. 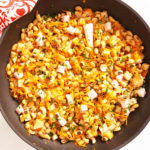 To make the best use of black-eyed peas, I started to explore the ways to prepare them and Skillet Black-Eyed Peas with Ham Leftovers is the result. Since these peas bring luck if prepared for New Year’s Day lunch, we are totally in. Who would resist to have more luck ? Anybody ? So, easy and slow day after festive night brings quick and frugal meal that uses the ham leftovers combined with good luck peas. It is ready in several minutes only and makes you feel good. Ham leftovers enrich flavours and, all ingredients together, make beautiful comfort food for winter day. Skillet Black-Eyed Peas with Ham Leftovers : nice way to frugally combine ham leftovers and black-eyed peas for New Year's Day lunch. In a skillet, combine oil, carrot and ham. Cook for 3 – 5 minutes. Add black eyed peas, tomato puree, sour cream and parsley root and cook for 10 minutes. Since ham is already salted, try if salt needed and add accordingly. Add ground black pepper and origano to taste. Once done, garnish with chopped parsley leaves before serving. 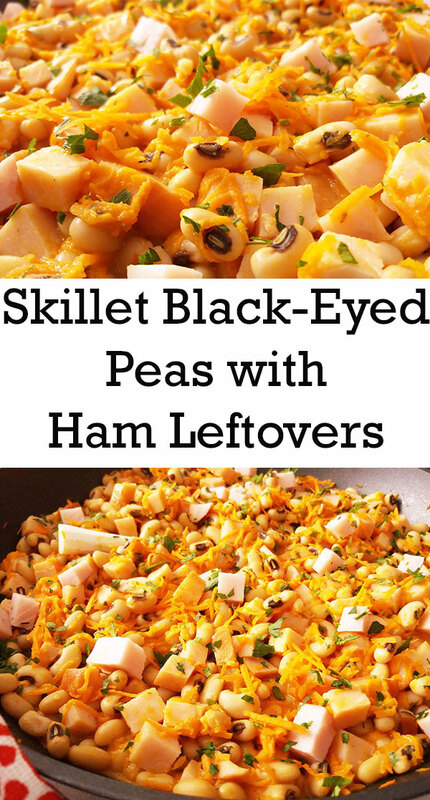 26 Responses to "Skillet Black-Eyed Peas with Ham Leftovers"
A great new twist to a culinary tradition. Having been raised in the Southern US, the custom of eating black-eyed peas (or Hoppin’ John) is well instilled in me. Although where we live now the custom isn’t known, we always serve those swelled up cowpeas on New Year’s day and this year we shall use your recipe. Holy yum! That’s such a delicious twist, I bet it tastes so yum. Hello 🙂 It is soooo good. Thank you and I wish you have a happy new year ! Oh please do. So tasteful and so into season:-) Thank you for coming ! I love Skillet Black-Eyed Peas with Ham Leftovers ! They look amazing! Oh yes, they are, frugal too 🙂 Thank you for commenting ! I never did the black eyed peas traditional thing, probably because I didn’t know about it. But I also don’t find them in my top favorite beans. I’ve just probably shocked all southerners, but they seem drier than other… and during our lean years, all I did was cook beans. maybe i should give them a try again! Happy New Year! So comforting! What a great combination- I can even see it with an egg on top! As a child we lived in the southern United States for a few years. It was there that my mom began the tradition of making black eyed peas for good luck on New Years’s day. I had forgotten all about it until your post brought back memories! Might have to make a pot, served with corn bread of course. Thank you Deb 🙂 Have health and happiness in the year to come ! Dear Chocolate Sister ! Thank you for being that kind all the time and I wish you and your loved ones to be healthy and happy in 2019. I didn’t learn about this tradition until a few years ago, and actually that was when I first tired black-eyed peas. I like them! What a perfect way to use up the ham. Me too learned about this tradition only recently. Thank you for coming and I wish you have happy and healthy 2019. Waste not, want not… I do like dishes that “recycle” leftovers. Often I find they’re even more delicious than the original meal. Happy New Year to you both! Agree completely.. It seems that the flavours need a day to be more inviting. Thank you Frank. I wish you and your family to be healthy and happy ! I like your combination. 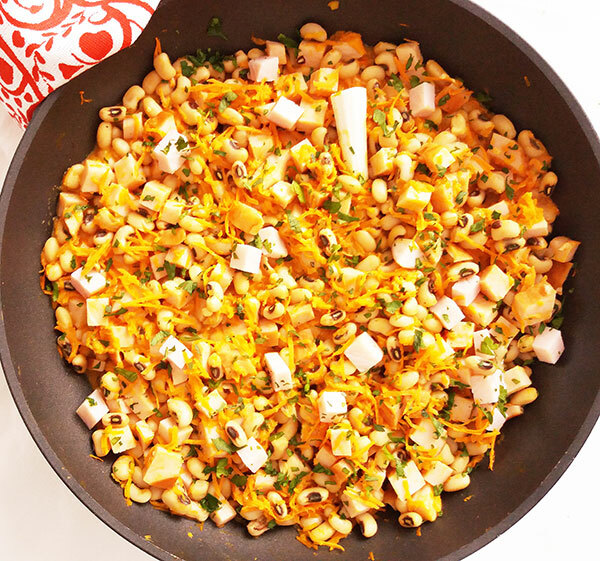 I’m serving black eyed peas today and will surely have some leftover and this sounds like a nice way to use them. Happy New Year! Hello Karen. Glad you find it inviting 🙂 I wish you have happy new 2019. too ! Hello Laura ! If ham is there already, this could make an excellent lunch:-) Thank you for commenting !